Being Frugal and Making It Work: What is a Diaper Cake? I asked that same question the first time I heard about diaper cakes. Do you eat them? Why are they made of diapers? Well, I found out just how popular diaper cakes are today. Baby shower gifts have become more creative. Just wrapping a plain baby blanket and booties in a box is not making an impact on the gift opening activities. But a diaper cake, with layers of diapers, stacked and wrapped with cute blankets and "ingredients" that are both fun and practical, makes a big hit as a baby shower centerpiece. You may see sweet plush animals added along with baby clothing and accessories. 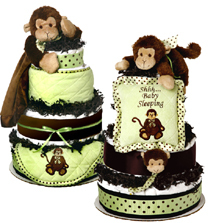 And a theme, such as the ever popular monkey and safari themes, can add to the festivities! Some diaper cakes even feature the new baby's name or come boasting the gender with pink or blue accessories. Neutral colors and generic baby items are great when the gender is yet unknown. Diaper cakes look like a stack of cake layers, much like a wedding cake, and come in various sizes and a multitude of styles, including collegiate diaper cakes that get the baby started with Mom and/or Dad's favorite team. Anyway you "bake" it, the diaper cake is a welcome addition to the gifts for the new mom to enjoy with baby. Check out the cute diaper cake styles at StorkandVeil.com, where the "baker" has the best diaper cake "recipes"! A special thanks to Julia from StorkandVeil for sharing this post about diaper cakes with us! These are so cute! I've been hearing a lot about diaper cakes lately!